Before embarking on this study, the reader is asked to absorb a few Greek terms for which there is no English word that would not be imprecise or misleading. Chief among these is NOUS, which refers to the `eye of the heart' and is often translated as mind or intellect. Here we keep the Greek word NOUS throughout. The adjective related to it is NOETIC (noeros). Another pair of words, PRAXIS (action) and THEORIA (vision) generally refer in the patristic writings to ascetic practice and the vision of God respectively. The use of `contemplation' for THEORIA has been avoided. NEPSIS is the kind of sober-minded vigilance that characterises the ascetic life of the Fathers. It is usually translated as watchfulness. The adjective is NEPTIC. HESYCHIA means stillness, and the practice of stillness in the presence of God is called HESYCHASM. I could not have undertaken this work without the help of the English translation of three volumes of the Greek Philokalia. In the bibliography and in the footnotes to our author's rich offering of quotations I have indicated these and other published translations of which I made use, sometimes altering the wording. I have also found helpful the many translations into modern Greek which are increasingly making their appearance. I gratefully acknowledge the encouragement, help and advice given by the author and by Miss Effie Mavromichali, who has translated some of his other books into English. I hope very much that if there are mistakes, I will be forgiven and told about them so that they may be corrected in the future. At the beginning of this year Mrs Esther Williams of England presented me with an English translation of my book "Orthodox Psychotherapy" which she said just finished. I was indeed greatly surprised that a person unknown to me would show such an interest in the subject of this book and would engage herself in translation of it with admirable diligence and commitment. I feel the need to thank her deeply and pray to God to give her strenght, to illumine her and grant her every perfect gift. It should be noted that with its first publication in Greece, in 1986 "Orthodox Psychotherapy" gave rise to many discussions which result in the publication of three other books, all relevant in content. One of them has already been translated into English under the title "The Illness and Cure of the Soul in the Orthodox Tradition". Yet it is this first book that contains the important message that the church can heal an ailing personality. The term "Orthodox Psychotherapy" does not refer to specific cases of people suffering from psychological problems of neurosis. Rather it refers to all people. According to Orthodox Tradition, after Adam's fall man became ill; his "nous" was derkened and lost communion with God. Death entered into the person's being and caused many anthropological, social, even ecological problems. In the tragedy of his fall man maintained the image of God within him but lost completely the likeness of Him, since his communion with God was disrupted. However the incarnation of Christ and the work of the Church aim at enabling the person to attain to the likeness of God, that is to reestablish communion with God. This passage way from a fallen state to divinization is called the healing of the person, because it is connected with his return from a state of being contrary to nature, to that of a state according to nature and above nature. By adhering to Orthodox therapeutic treatment as conceived by the Holy Fathers of the Church man can cope successfully with the thoughts (logismoi) and thus solve his problems completely and comprehensively. I would like to reemphasize that the diagnoses of all neurotic and pathological states are not the subject of this book; for they belong to the domain of psychiatry and neurology. On the other hand many psychological illnesses are cuased by the anxiety of death, the lack of meaning in life, a guilty conscience and the loss of communion with God on man's part. Surely the theology of the Church can help by either preventing or by healing people suffering from such existential dilemmas. Thus psychiatry and neurology are called to cure pathological anomalies, whereas Orthodox theology cures the deeper causes that engender them. The reader of this book will find in it the pathway by which a person arrives at communion with God, thus fulfilling the destiny of human existence as well as the method by which he can even protect himself from various physical illnesses. Orthodox psychotherapy will therefore be more helpful to those who want to solve their existential problems; those who have realised that their nous has been darkened and for this reason they must be delivered from the tyranny of their passions and thoughts (logismoi) in order to attain to the illumination of their nous and communion with God. All this therapeutic treatment or psychotherapy is closely connected with the neptic tradition of the Church and its hesychastic life, as it is preserved in ther texts of the Philokalia, in the works of the Fathers of the Church and notably in the teaching of St. Gregory Palamas. Certainly one should not disregard the fact that the neptic and hesychastic life is the same life which one sees in the life of the Prophets and the Apostles as is described precisely in the texts of Holy Scripture. It will be made clear in the analysis of the chapters in this book that the neptic life is in fact the life of the Gospels. I am pleased that this book will be read by an English speaking audience because I feel that the neptic and ascetic life had also existed in the western world before it was substituted by Scholastic theology. Scholasticism, indeed, connected knowledge with reason and has created serious problems when one conciders that knowledge refers to the whole of human existence and is not simply exhausted by reason. I believe that the greatest problem of western philosophy is that it identifies the nous with reason and intellectual knowledge with existensial knowledge. Even contemporary scholars in the West point to this fact. In truth the neptic tradition is the common tradition of both the East and the West, before the intrusion of scholasticism and the identification of theology with metaphysics. And it is this tradition which fully calms man's spirit which seeks fulfilment, inner peace and stillness. Within the turmoil and pain of today's world which distresses us and torments us; and which forsakes us to real hunger and thirst it is necessary that we find and live this therapeutical way, as recommended to us by the Holy Fathers of the Church it creates spiritual and solves the existential, social and ecological problems. Surely the holy Fathers of the Church preceeded contemporary psychologists and psychiatrists. Persons who have been healed are the evidence that the Church intervenes in society in a salvific way. It is precisely this great purpose which the Orthodox Church serves through her theology and life. Contemporary man, tired and discouraged by the various problems which torment him, is looking for rest and refreshment. Basically he is seeking a cure for his soul, as it is mainly there that he feels the problem. He is going through a `mental depression'. For this reason psychiatric explanations are circulating broadly in our time. Psychotherapy in particular is widespread. While these things were almost unknown before, they are horribly prevalent now, and many people are turning to psychotherapists to find peace and comfort. For I repeat, contemporary man feels that he is in need of healing. Along with realising this fundamental need, I notice every day that Christianity, and especially Orthodoxy, which preserves the essence of Christianity, is making much use of `psychotherapy', or rather, that Orthodoxy is mainly a therapeutic science. Every means that it employs, and indeed its very aim, is to heal man and guide him to God. For in order to attain communion with God and achieve the blessed state of divinisation, we must first be healed. So, beyond all other interpretations, Orthodoxy is mainly a therapeutic science and treatment. It differs clearly from other psychiatric methods, because it is not anthropocentric but the anthropocentric and because it does not do its work with human methods, but with the help and energy of divine grace, essentially through the synergy of divine and human volition. I have wanted to emphasise certain truths in this book. I have wished to point out the essence of Christianity and also the method which it employs for achieving this healing. My basic aim is to help contemporary man to find his cure within the Orthodox Church, as we too are struggling to attain it. I realise that we are all sick and seeking the Physician. We are ill and seeking a cure. The Orthodox Church is the inn and hospital in which every sick and distressed person can be cured. If this book becomes the occasion for some people to turn for their healing to the Church and its teaching, I will praise God Who gave me the inspiration and strength to carry out this difficult undertaking, and I will ask Him to have mercy on me for my many weaknesses. the Enlightener, Bishop of Great Armenia. I feel it my duty to give a few basic explanations for the study and understanding of the chapters which follow. The title `Orthodox Psychotherapy' has been given to the book as a whole because it presents the teaching of the Fathers on curing the soul. I know that the term `psychotherapy' is almost modern and is used by many psychiatrists to indicate the method which they follow for curing neurotics. But since many psychiatrists do not know the Church's teaching or do not wish to apply it, and since their anthropology is very different from the anthropology and soteriology of the Fathers, in using the term `psychotherapy', I have not made use of their views. It would have been very easy at some points to set out their views, some of which agree with the teaching of the Fathers and others of which are in conflict with it, and to make the necessary comments, but I did not wish to do that. I thought that it would be better to follow the teaching of the Church through the Fathers without mingling them together. Therefore I have prefixed the word `Orthodox' to the word `Psychotherapy' (healing of the soul), to make the title "Orthodox Psychotherapy". It could also have been formulated as "Orthodox Therapeutic Treatment". Many teachings of the Fathers are cited with their references to support the text as it develops. I am well aware that texts containing a large number of references are not easy to read. However, I preferred this safer method, rather than making the study easy to read. Unfortunately, books nowadays are often read in a sentimental way, and I did not wish this subject, so crucial today, to be written in that way. We have made use of many Fathers in developing the subject, most of all the so-called neptic Fathers, without of course overlooking the so-called social ones. I say "so-called" because I do not believe that this distinction exists in essence. In Orthodox theology those called neptics are eminently social and those called social are essentially neptic. The Three Hierarchs, for example, lived a watchful, ascetic life, they purified their minds, and thus they shepherded the people of God. I believe firmly that the social quality of the saints is a dimension of asceticism. There is a great deal of neptic teaching in the works of the Three Hierarchs. But I have made greater use of the Fathers of the "Philokalia" since they have abundant material and since the "Philokalia" is a collection of mystical theological texts and "constitutes a highly inspired effulgence of the hallowed ascetic experience of divine patristic figures on whom shone the holy and life-giving spirit" (Gk.Philokalia I, editors' prologue, p.9). According to the editors of the Greek edition of the Philokalia, after the cessation of the hesychastic conflicts of the fourteenth century the need arose for a collection of the principle works of the Fathers concerning hesychastic life and noetic prayer. They wrote: "There is every indication that the collection was made by highly spiritual monks of Mount Athos from the library of the Holy Mountain, and begun in the second half of the fourteenth century, from 1350 on. This period coincides with the cessation of the famous hesychastic controversies. Concretely it ends with the triumphant Synodic justification of the Athonite Fathers. At that time it had become clear that there was need of a statement of the view of the Eastern Orthodox Fathers concerning hesychastic asceticism and noetic prayer. These had been a target of rationalising and socially active Roman Catholicism with the appearance of the slandererous monk Barlaam from Calabria, afterwards a bishop of the Roman Catholic Church (Gk.Philokalia I, p.1-11). The final elaboration of the texts of the Philokalia was made by St. Makarios, former Bishop of Corinth, and St. Nikodimos of the Holy Mountain and so "the Philokalia in a way takes on the dimensions of a Synodal presentation of the Mystical Theology of the Eastern Orthodox Church..." (p.11). For this reason the texts of the Fathers of the Philokalia have been used, with a view to describing and presenting the Church's teaching about the illness and cure of the soul, nous, heart, and thoughts. However, where there was need I have not hesitated to turn to the texts of other great Fathers, such as St. Gregory the Theologian, St. Gregory Palamas (especially his `Triads'), St. John Chrysostom, St. Basil the Great, St. Symeon the New Theologian, etc. It is true that there is not a special chapter devoted to the sacraments of Holy Baptism and Holy Communion. In many places the great value of the sacramental life of our Church is emphasised. However, there is no special word about Baptism because I know that I am speaking to people who have already been baptised and so there is presumably no need for it. On the other hand, the sacrament of the Divine Eucharist is the centre of the spiritual and sacramental life of the Church. Holy Communion is what differentiates the asceticism of the Orthodox Church from all other "asceticism". I regard it as very necessary for man's spiritual life and for his salvation. But preparation is needed in order to be able worthily to have communion of the Body and Blood of Christ. For Holy Communion, according to the liturgical prayers, is for those who are prepared a light which enlightens, and for those not prepared it is a consuming fire. The Apostle Paul says: "Whoever eats the bread or drinks the cup of the Lord in an unworthy manner will be guilty of profaning the body and blood of the Lord. Let a man examine himself, and so eat of the bread and drink of the cup. For any one who eats and drinks without discerning the body eats and drinks judgement upon himself. That is why many of you are weak and ill, and some have died" (1Cor.11,27-30). We are living in a time when much is being said about ecclesiology, eucharistiology and eschatology. We have no objection to this. We believe that these are the essential elements of the spiritual life. But the Church, the holy Eucharist and eschatology are closely connected with the ascetic life. I firmly believe that priority must be given to the subject of the ascetic life, which is the path of preparation for Holy Communion. And because this aspect is being disregarded, it has been necessary to give special emphasis to these matters. Holy Communion helps to cure if all the other religious treatment which is the basis of Orthodox asceticism is followed. Much is being said today about psychological problems. I believe that the so-called psychological problems are mainly problems of thoughts, a darkened mind, and an impure heart. The impure heart as described by the Fathers, the dark and gloomy mind and impure thoughts are the source of all the so-called psychological problems. When a man is inwardly healed, when he has discovered the place of his heart, when he has purified the noetic part of his soul and freed his intelligence, he has no psychological problems. He lives in the blessed and undisturbed peace of Christ. We say these things with the reservation that the body, of course, can be made sick by fatigue, exhaustion, weakening, and decay. The first chapter, entitled "Orthodoxy as a therapeutic science", can be characterised as a summary of the whole book. In fact it includes the main points in all the chapters. I confess that the third chapter, entitled "Orthodox psychotherapy", is difficult in some places. I could not avoid this because I had to analyse the terms soul, nous, heart and intelligence and consider their interrelationships and differences. A seventh chapter, entitled "Noetic prayer as a method of healing", could perhaps have been written. But since there were places in all the chapters in which the value and necessity of prayer were emphasised, especially in the chapter on hesychia as a method of therapy, and since there are excellent books describing the method and value of noetic prayer, I have preferred not to include this chapter, in spite of the original intention. I recommend a study of other books which are in circulation. I would ask that this book be not only read but also studied. It might need to be studied for a second and third time, with the particular purpose of being applied. May the holy Fathers whose teaching is presented here enlighten both me and the readers so that we may proceed on the path of the healing and salvation of our souls. I sincerely ask God that any mistakes which I may have made should be corrected and that they should not do harm to the souls of the readers, since these chapters were written in order to help and not to harm. Likewise I beg the readers who find any mistakes to let me know so that they can be corrected. In conclusion I would like to thank all who have helped with this publication. The benefit which may result will be due to them as well. "May the Lord grant them their hearts' desire". Many people interpreting the character of Christianity see it as one of the numerous philosophies and religions known from antiquity. Certainly Christianity is not a philosophy in the sense that prevails today. Philosophy sets up a system of thought which in most cases bears no relationship to life. The main difference between Christianity and philosophy is that the latter is human thinking, while Christianity is a revelation of God. It is not a discovery by man but a revelation by God Himself to man. It was impossible for human logic to find the truths of Christianity. Where the human word was powerless, there came the divine-human Word, or Christ the Godman, the Word of God. This divine revelation was formulated in the philosophical terms of the time, but again it must be emphasised that it is not a philosophy. The garments of the divine-human Word are taken from the philosophy of that time. St. John Chrysostom, interpreting Isaiah 3,1: "Behold the Lord, the Lord of Hosts, takes away from Jerusalem and from Judah...the mighty man and the soldier, the judge and the prophet, the diviner...", observes: "He seems here to be calling a diviner a person who is capable of conjecturing the future through profound intelligence and experience of things. Divining and prophesying are indeed two different things: the prophet, setting self aside, speaks under divine inspiration; the diviner for his part starts from what has already happened, puts his own intelligence to work and foresees many future events, as an intelligent person normally does. But the difference between them is great: it is the distance that separates human intelligence from divine grace" (1). So speculation (or philosophy) is one thing, and prophecy, or the word of the prophet who theologises, is another. The former is a human activity while the latter is a revelation of the Holy Spirit. In the patristic writings, and especially in the teaching of St. Maximus, philosophy is referred to as the beginning of the spiritual life. However, he used the term `practical philosophy' to mean cleansing the heart from passions, which really is the first stage of the soul's journey towards God. Yet Christianity cannot be regarded as a religion, at least not as religion presents itself today. God is usually visualised as dwelling in heaven and directing human history from there: He is extremely exacting, seeking satisfaction from man, who has fallen to earth in his sickness and weakness. There is a wall of separation between God and man. This has to be surmounted by man, and religion is a very effective help. Various religious rites are employed for this purpose. According to another view, man feels powerless in the universe and needs a mighty God to help him in his weakness. In this view God does not create man, but man creates God. Again, religion is conceived as man's relationship to the Absolute God, that is to say, the "relationship of the `I' to the Absolute Thou". Yet again, many regard religion as a means whereby the people are deluded into transferring their hopes to the future life. In this way strong powers put pressure on the people by means of religion. But Christianity is something higher than these interpretations and theories; it cannot be contained within the usual conception and definition of religion given in the "natural" religions. God is not the Absolute Thou, but a living Person Who is in organic communion with man. Moreover Christianity does not simply transfer the problem to the future or await the delight of the kingdom of heaven after history and after the end of time. In Christianity the future is lived in the present and the kingdom of God begins in this life. According to the patristic interpretation, the kingdom of God is the grace of the Triune God, it is vision of the uncreated Light. We Orthodox are not waiting for the end of history and the end of time, but through living in Christ we are running to meet the end of history and thus already living the life expected after the Second Coming. St. Symeon the New Theologian says that he who has seen the uncreated light and united with God is not awaiting the Second Coming of the Lord but living it. So the eternal embraces us at every moment of time. Therefore past, present and future are essentially lived in one unbroken unity. This is so-called condensed time. Thus Orthodoxy cannot be characterised as the `opium of the people', precisely because it does not postpone the problem. It offers life, transforms biological life, sanctifies and transforms societies. Where Orthodoxy is lived in the right way and in the Holy Spirit, it is a communion of God and men, of heavenly and earthly, of the living and the dead. In this communion all the problems which present themselves in our life are truly resolved. Yet since the membership of the Church includes sick people and beginners in the spiritual life, it is to be expected that some of them understand Christianity as religion in the sense referred to above. Moreover, the spiritual life is a dynamic journey. It begins with baptism, which is purification of the `image', and continues through ascetic living aimed at attaining `likeness', which is to say communion with God. Anyway it must be made clear that even when we still speak of Christianity as a religion we must do it with certain necessary presuppositions. The first is that Christianity is mainly a Church. `Church' means `Body of Christ'. There are many places in the New Testament where Christianity is called the Church. We shall only mention Christ's words: "You are Peter, and on this rock I will build my church" (Matt.16:18) and the words of the Apostle Paul to the Colossians: "And he is the head of the body, the church" (1:18) and to his disciple Timothy: "...so that you may know how you ought to conduct yourself in the house of God, which is the church of the living God, the pillar and ground of the truth" (1Tim,.3,15). This means that Christ does not simply dwell in heaven and direct history and the lives of men from there, but He is united with us. He assumed human nature and deified it; thus in Christ deified human nature is at the right hand of the Father. So Christ is our life and we are `members of Christ'. The second presupposition is that the aim of the Christian is to attain the blessed state of deification. Deification is identical with `likeness', that is, to be like God. However, in order to reach the likeness, to attain the vision of God, and for this vision not to be a consuming fire but a life-giving light, purification must previously have taken place. This purification and healing is the Church's work. When the Christian participates in worship without undergoing life-giving purification - and moreover these acts of worship also aim towards man's purification - then he is not really living within the Church. Christianity without purification is utopia. So when we are being purified, especially when we are seeing to our healing, we can speak of religion. And this accords with the words of the Lord's brother James: "If anyone among you thinks he is religious, and does not bridle his tongue but deceives his own heart, this one's religion is useless. Pure and undefiled religion before God and the Father is this: to visit orphans and widows in their trouble, and to keep oneself unspotted from the world" (Jas.1:26-27). This abstinence gives us the right to claim that Christianity is neither philosophy nor `natural' religion, but mainly healing. It is the healing of a person's passions so that he may attain communion and union with God. In the parable of the Good Samaritan the Lord showed us several truths. As soon as the Samaritan saw the man who had fallen among thieves who had wounded him and left him half dead, he "had compassion on him and went to him and bandaged his wounds, pouring on oil and wine; and he set him on his own animal, brought him to an inn and took care of him" (Luk.10:33f). Christ treated the wounded man and brought him to the inn, to the Hospital which is the Church. Here Christ is presented as a physician who heals man's illnesses, and the Church as a Hospital. It is very characteristic that in analysing this parable St. John Chrysostom presents the truths which we have just emphasised. Man went down "from the heavenly state to the state of the devil's deception, and he fell among thieves, that is, the devil and the hostile powers". The wounds which he sustained are the various sins. As David says, "My wounds are foul and festering because of my foolishness" (Ps.38:5). For "every sin brings bruises and wounds". The Samaritan is Christ Himself, who came down from heaven to earth to heal wounded man. He used wine and oil for the wounds. That is to say, "by mixing the Holy Spirit with his blood, he brought life to man". According to another interpretation, "oil brings the comforting word, wine provides the astringent lotion, the instruction which brings concentration to the scattered mind". 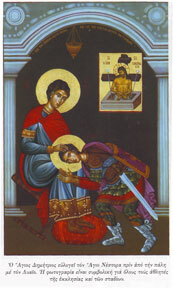 He set him upon his own animal: "Taking flesh upon his own divine shoulders, he lifted it towards the Father in Heaven". Thereupon the good Samaritan, Christ, led the man "into the wonderful and spacious inn, this universal Church". He gave him to the innkeeper, who is the Apostle Paul and "through Paul to the high priests and teachers and ministers of each church", saying: "Take care of the people of the Gentiles whom I have given to you in the Church. Since men are sick, wounded by sin, heal them, putting on them a stone plaster, that is, the prophetic sayings and the gospel teachings, making them whole through the admonitions and exhortations of the Old and New Testaments." So according to St. John Chrysostom, Paul is the one who upholds the churches of God "and heals all men through spiritual admonitions, distributing the bread of offering to each one..." (2). In St. John Chrysostom's interpretation of this parable it is clearly evident that the Church is a Hospital which heals those sick with sin, while the bishops and priests, like the Apostle Paul, are the healers of the people of God. These truths also appear in many other places in the New Testament. The Lord said: "Those who are well have no need of a physician, but those who are sick" (Matt.9:12). Likewise Christ, as a physician of souls and bodies, was "...healing all kinds of sickness and all kinds of disease among the people...and they brought to him all sick people who were afflicted with various diseases and torments, and those who were demon-possessed, epileptics, and paralytics; and he healed them" (Matt.4:23f). The Apostle Paul is well aware that the conscience of men, especially of simple ones, is weak: "When you thus sin against the brethren, and wound their weak conscience, you sin against Christ" (ICor.8:12). The Book of Revelation says that John the Evangelist saw a river of the water of life proceeding from the throne of God and of the Lamb. "On either side of the river was the tree of life...and the leaves of the tree were for the healing of the nations" (Rev.22:1f). So the work of the Church is therapeutic. It seeks to heal men's sicknesses, mainly those of the soul, which torment them. This is the basic teaching of the New Testament and of the Fathers of the Church. In what follows in this chapter as well as in other chapters many passages from the Fathers will bring out this truth. Here again I want to emphasise the indispensability of the Church. I am very grateful to the priest and professor John Romanides for laying stress on this in his writings. I am convinced that he is very well read in the neptic Fathers -especially in the writings contained in the Philokalia - and has therefore grasped the real meaning of Christianity. I believe that this is his great contribution. For in this era when Christianity is being presented as a philosophy or intellectual theology or a culture and popular tradition - customs and manners - he presents this teaching about a therapeutic discipline and treatment. Concretely, he says: "Having faith in Christ without undergoing healing in Christ is not faith at all. Here is the same contradiction that we find when a sick person who has great confidence in his doctor never carries out the treatment which he recommends. If Judaism and its successor, Christianity, had appeared in the twentieth century for the first time, they would most likely have been characterised not as religions but as medical sciences related to psychiatry. They would have a wide influence on society owing to their considerable successes in healing the ills of the partially functioning personality. In no way can prophetic Judaism and Christianity be construed as religions that use various magical methods and beliefs to promise escape from a supposed world of matter and evil or hypocrisy into a supposed spiritual world of security and success" (3). In another work the same professor says: "The patristic tradition is neither a social philosophy nor an ethical system, nor is it religious dogmatism: it is a therapeutic treatment. In this respect it closely resembles medicine, especially psychiatry. The spiritual energy of the soul that prays unceasingly in the heart is a physiological instrument which everyone has and which requires healing. Neither philosophy nor any of the known positive or social sciences is capable of healing this instrument. That can only be done through the Fathers' neptic and ascetic teaching. Therefore those who are not healed usually do not even know of the existence of this instrument" (4). So in the Church we are divided into the sick, those undergoing therapeutic treatment, and those - saints - who have already been healed. "The Fathers do not categorise people as moral and immoral or good and bad on the basis of moral laws. This division is superficial. At depth humanity is differentiated into the sick in soul, those being healed and those healed. All who are not in a state of illumination are sick in soul...It is not only good will, good resolve, moral practice and devotion to the Orthodox Tradition which make an Orthodox, but also purification, illumination and deification. These stages of healing are the purpose of the mystical life of the Church, as the liturgical texts bear witness" (5). From what has been said so far it is clear that Christianity is principally a science which cures, that is to say, a psychotherapeutic method and treatment. The same should be said of theology. It is not a philosophy but mainly a therapeutic treatment. Orthodox theology shows clearly that on the one hand it is a fruit of therapy and on the other hand it points the way to therapy. In other words, only those who have been cured and have attained communion with God are theologians, and they alone can show Christians the true way to reach the `place' of cure. So theology is both a fruit and a method of therapy. Here we need to enlarge on what has been said in order to see these truths more clearly. We shall cite teachings of the Holy Fathers relating to theology and theologians. I think that we should begin with St. Gregory Nazianzen, for it was not by chance that the Church gave him the title of Theologian. In the beginning of his famous theological texts he writes that it is not for everyone to theologise, to speak about God, because the subject is not so cheap and low. This work is not for all men but "for those who have been examined and are passed masters in the vision of God and who have previously been purified in soul and body, or at the very least are being purified". Only those who have passed from praxis to theoria, from purification to illumination, can speak about God. And when is this? "It is when we are free from all external defilement or disturbance, and when that which rules within us is not confused with vexations or erring images." Therefore the saint advises: "For it is necessary to be truly at ease to know God" (6). Neilos the Ascetic links theology with prayer, principally with noetic prayer. We know very well from the teaching of the Holy Fathers that anyone who has acquired the grace of prayer of the heart has entered the first stages of the vision of God, for this type of prayer is a form of theoria. Therefore all who pray with the nous have communion with God, and this communion is man's spiritual knowledge of God. So St. Neilos says: "If you are a theologian, you will pray truly. And if you pray truly, you are a theologian" (7). St. John Climacus introduces true theology in many places in his spiritually delightful `Ladder'. "Total purity is the foundation for theology." "When a man's senses are perfectly united to God, then what God has said is somehow mysteriously clarified. But where there is no union of this kind, then it is extremely difficult to speak about God" (8). On the contrary, the man who does not actually know God speaks about Him only "in probabilities" (9). Indeed according to patristic teaching it is very bad to speak in conjectures about God, because it leads a person to delusion. This saint knows how "the theology of the demons" develops in us. In vainglorious hearts which have not previously been purified by the operation of the Holy Spirit, the unclean demons "give us lessons in the interpretation of scripture" (10). Therefore a slave of passion should not "dabble in theology" (11). The saints received "divine things without thought", and according to the Fathers, they theologised not in an Aristotelian way through thinking, but "in the manner of the Apostles", that is to say through the operation of the Holy Spirit. If a person has not been cleansed of passions, especially fantasy, beforehand, he is unable to converse with God or to speak about God, since a nous "forming notions is incapable of theology". The saints lived a theology "written by the Spirit". We find the same teaching in the works of St. Maximus the Confessor. When a person lives by practical philosophy, which is repentance and cleansing from passions, "he advances in moral understanding". When he experiences theoria, "he advances in spiritual knowledge". In the first case he can discriminate between virtues and vices; the second case, theoria, "leads the participant to the inner qualities of incorporeal and corporeal things". St. Maximus goes on to say that man is "granted the grace of theology when, carried on wings of love" in theoria and "with the help of the Holy Spirit, he discerns - as far as this is possible for the human nous - the qualities of God" (12). Theology, the knowledge of God, is unfolded to the person who has attained theoria. Indeed in another place the same Father says that a person who always "concentrates on the inner life" not only becomes restrained, long-suffering, kind and humble, but "he will also be able to contemplate, theologise and pray" (13). Here too theology is closely connected with theoria and prayer. It must be emphasised that a theology that is not the result of purification, that is, of `praxis', is demonic. According to St. Maximus, "knowledge without praxis is the demons' theology" (14). St. Thalassios, who had the same perspective, wrote that when man's nous begins with simple faith, it "will eventually attain a theology that transcends the nous and that is characterised by unremitting faith of the highest type and the vision of the invisible" (15). Theology is beyond logic, it is a revelation of God to man, and the Fathers define it as theoria. Here too theology is chiefly vision of God. In another place the same saint wrote that genuine love gives birth to spiritual knowledge, and "this is succeeded by the desire of all desires: the grace of theology" (16). In the teaching of St. Diadochos of Photiki theology is presented as the greatest gift offered to man by the Holy Spirit. All God's gifts of grace are "flawless", "but the gift which inflames our heart and moves it to the love of His goodness more than any other is theology". For theology, as "the early offspring of God's grace," "bestows on the soul the greatest gifts" (17). According to the Apostle Paul, the Holy Spirit gives spiritual knowledge to one person and wisdom to another (ICor.12,8). Interpreting this, St. Diadochos says that spiritual knowledge unites man to God but does not move him to express outwardly what he knows. There are monks who love hesychia and are illuminated by the grace of God "yet do not speak about God". Wisdom is one of the rarest gifts, one which God gives to the person who has both expression and a capacious intellect. Therefore knowledge of God "comes through prayer, deep stillness and complete detachment, while wisdom comes through humble meditation on Holy Scripture and, above all, through grace given by God" (18). The gift of theology is a work of the Holy Spirit but in cooperation with man, since the Holy Spirit does not actualise in man a spiritual knowledge of the mysteries "apart from that faculty in him which naturally searches out such knowledge" (19). In the teaching of St. Gregory Palamas it is those who see God who are properly theologians, and theology is theoria. "For there is a knowledge about God and His doctrines, a theoria which we call theology..." (20). Anyone who without knowledge and experience of matters of faith offers teaching about them "according to his own reasonings, trying with words to show the Good that transcends all words, has plainly lost all sense." And in his folly "he has become an enemy of God" (21). Moreover there are cases in which people without having works, that is to say, without having undergone purification, have met and listened to holy men, but then they "try to form their own conceptions" and both reject the holy man and puff themselves up with pride (22). All these things show that theology is properly the fruit of man's healing and not a rational discipline. Only a person who has been purified or at least is being purified can be initiated into the ineffable mysteries and great truths, can receive revelations and afterwards convey them to the people. Therefore in the Orthodox patristic tradition theology is linked and identified with the spiritual father, and the spiritual father is the theologian par excellence - that is to say, the one who experiences the things of God and so can lead his spiritual children unerringly. Father John Romanides writes characteristically: "The true Orthodox theologian is the one who has direct knowledge of some of God's energies through illumination or knows them more through vision. Or he knows them indirectly through prophets, apostles and saints or through scripture, the writings of the Fathers and the decisions and acts of their Ecumenical and Local Councils. The theologian is the one who through this direct or mediated spiritual knowledge and vision knows clearly how to distinguish between the actions of God and those of creatures and especially the works of the devil and the demons. Without the gift of discernment of spirits it is not possible to test spirits to see whether something is the action of the Holy Spirit or of the devil and the demons. Therefore the theologian and the spiritual father are the same thing. A person who thinks and talks in search of a conceptual understanding of the doctrines of the faith after the Franco-Latin pattern certainly is not a spiritual father, nor can he be called a theologian in the proper sense of the word. Theology is not abstract knowledge or practice, like logic, mathematics, astronomy and chemistry, but on the contrary, it has a polemical character like logistics and medicine. The former is concerned with matters of defence and attack through bodily drill and strategies for the deployment of weapons, fortifications and defensive and offensive schemes, while the latter is fighting against mental and physical illnesses for the sake of health and the means of restoring health. A theologian who is not acquainted with the methods of the enemy nor with perfection in Christ is not only unable to struggle against the enemy for his own perfection, but is also in no position to guide and heal others. It is like being called a general, or even being one, without ever having been trained or fought, or studied the art of war, having only given attention to the beautiful, glorious appearance of the army in its splendid, bright uniforms at receptions and displays. It is like a butcher posing as a surgeon or like holding the position of a physician without knowing the causes of illnesses or the methods of curing them, or the state of health to which the patient should be restored (23). Since we have said that Christianity and theology are primarily a therapeutic science, we must now outline briefly what therapy is. What does Orthodoxy with its theology and worship cure in us? Therapy of the soul essentially means therapy and freeing of the nous. Human nature became `sick' through its fall away from God. This sickness is mainly the captivity and fall of the nous. The ancestral sin is that man withdrew from God, lost divine grace, and this resulted in blindness, darkness and death of the nous. We can say more accurately that "the fall of man or the state of having inherited sin is: a) the failure of his noetic power to function soundly or even to function at all, b) the confusion of this power with the functions of the brain and of the body in general, and c) its resulting subjection to mental anguish and to the surrounding conditions. Every person has experience of the fall of his own noetic power to varying degrees, as he is exposed to an environment in which this power is not functioning or is below par... Malfunctioning of the noetic power results in bad relations between man and God and between people. It also results in the individual's making use of both God and fallen man to fortify his personal safety and happiness" (24). This loss of the grace of God deadened man's nous; his whole nature sickened, and he handed this sickness on to his descendants as well. In Orthodox teaching this is how we understand the inheritance of sin. The Fathers interpret St. Paul's "as by one man's disobedience many were made sinners" (Rom.5,19) not in legal terms but `medically'. That is to say, human nature became sick. St. Cyril of Alexandria interprets the situation thus: "After Adam fell by sin and sank into corruption, at once impure pleasures rushed in, and the law of the jungle sprang up in our members. So nature became sick with sin through the disobedience of one, Adam. Then the many became sinners, not as fellow transgressors with Adam, for they did not even exist, but as being of that nature which had fallen under the law of sin.... Human nature in Adam became sick through the corruption of disobedience, and thus the passions entered into it" (25). In another place the same Father uses the image of the root. Death came to the whole human race by Adam, "just as when the root of a plant is injured, all the young shoots that come from it must wither" (26). St. Gregory Palamas says characteristically: "The nous which has rebelled against God becomes either bestial or demonic and, after having rebelled against the laws of nature, lusts after what belongs to others..." (27). Through the "rite of birth in God", holy baptism, man's nous is illuminated, freed from slavery to sin and the devil, and is united with God. That is why baptism is called illumination. But after that, because of sin, the nous is again darkened and deadened. The patristic writings make it clear that every sin and every passion deadens the nous. St. John of the Ladder writes that the evil demons strive "to darken our spirit". Especially the demon of unchastity "by darkening our minds, which guide us, pushes people "to do things that only the mad would think of" (28). In another chapter attention will be given to the nature of man's nous. Here we are mainly concerned with the subject of darkening. St. Maximus teaches: "As the world of the body consists of things, so the world of the nous consists of conceptual images. And as the body fornicates with the body of a woman, so the nous, forming a picture of its own body, fornicates with the conceptual image of a woman" (29). This is the darkness and fall of the nous. In another connection the same holy Father teaches that "when the body sins through material things and has the bodily virtues to teach it self-restraint, so too when the nous sins through impassioned conceptual images, it has the virtues of the soul to instruct it" (30). This truth shows that the fall of the nous creates confusion in the whole spiritual organism. It creates anguish and agitation and in general makes the person live the fall in all its tragicalness. Thus many problems which plague us come from this inner sickness. That is why the psychotherapists cannot help very much, since it is only Christ who can restore the nous deadened by passions. Again St. Maximus, trying to define more clearly what is impurity of the nous and hence its fall, writes that it consists in four things: "first in having false knowledge; secondly in being ignorant of any of the universals...; thirdly in having impassioned thoughts; and fourthly in assenting to sin" (31). So the nous needs therapy, a therapy which the Fathers call quickening and purifying the nous. A great deal is said about purity of mind and heart in the teachings of the Lord and the Apostles. The Lord, referring to the Pharisees of his time who were careful of external purity and neglected inner purity, said: "Blind Pharisee, first cleanse the inside of the cup and dish, that the outside of them may be clean also" (Matt.23,26). At the Apostles' meeting in Jerusalem Peter, confronting the problem of the Christian Gentiles as to whether they must first be circumcised and keep the law of the Old Testament, said: "God, who knows the heart, acknowledged them, by giving them the Holy Spirit just as he did to us, and made no distinction between us and them, purifying their hearts by faith" (Acts 15,8f). The Apostle Paul recommended to the Christians of Corinth: "Let us cleanse ourselves from all filthiness of the flesh and spirit, perfecting holiness in the fear of God" (2Cor.,7,1). The blood of Christ shall "purge your conscience from dead works" (Heb.9,14). Likewise the same Apostle, writing to his disciple Timothy, affirms that we hold the mystery of the faith "with a pure conscience" (1 Tim,3,9). And the Apostle Peter is well aware that love for one another is the fruit of a pure heart, so he says: "Love one another fervently with a pure heart" (1 Pet.1,22). So purification of the nous and heart is essential. We write about the nous and the heart even though we know that in patristic theology these two are joined together. We shall come back to that, however, in another chapter. St. Maximus divides the spiritual life into three stages. They are practical philosophy natural theoria and mystical theology. According to a study of Maximus, "his teaching about a personal approach to salvation, is divided into three basic parts: 1) `practical philosophy' or praxis 2) `natural theoria' or simply theoria and 3) `mystical theology' or simply theology. The first purifies a person of passions and adorns him with virtues; the second illuminates his nous with true knowledge; and the third crowns him with the highest mystical experience, which St. Maximus calls `ecstasy'. These three parts constitute the basic stages on the path of man's personal salvation (32). Indeed it must be noted that many Fathers distinguish these three stages in the spiritual life: practical philosophy or purification of the heart, natural theoria or illumination of the nous, and mystical theology or communion with God through theoria. According to another division which appears in the patristic writings, the spiritual life is separated into praxis and theoria. This is not a distinction clearly opposed to the preceding one, but really the same thing. For praxis is purification, and theoria is illumination of the nous and communion with God. In any case praxis precedes theoria, the vision of God. "Praxis is the patron of theoria" (33). More analytically, "praxis where the body is concerned consists of fasting and vigil, where the mouth is concerned it consists of psalmody. But prayer is better than psalmody, and silence more valuable than speech. In the case of the hands, praxis is what they do uncomplainingly..." (34). And: "Theoria is the nous's vision; it is to be amazed and to understand all that has been and is to be." (35). Certainly according to St. Maximus' teaching, theoria is not independent of praxis. "Praxis is not safe without theoria, nor is theoria true without praxis. For praxis must be intelligent and theoria must be efficacious...". Maximus does emphasise that "in the case of the more learned, theoria precedes praxis, whereas with simpler people praxis comes first". In both cases however, the outcome is good, they lead to the same result, the purification and salvation of man (36). Actually when we speak of purifying the soul, we mean principally releasing it from the passions (37), or rather transforming the passions. Furthermore, purification is also the "uniform development" of the human being, which leads to illumination of the nous. So purification is not only negative but also positive. The qualities of a pure soul are "intelligence devoid of envy, ambition free from malice, and unceasing love for the Lord of glory" (38). In other words, if we are motivated by envy and our ambition contains malice and our love for God is not unceasing, it means that our heart has not yet been purified. The nous is that which is in the image of God. We have defiled this image with sin and it must now be cleansed. Therefore Abba Dorotheos requests: "Let us make our image pure as we received it..."(39). We shall have to suffer toil and intolerable bitterness until we have purified our nous, that "cur sniffing around the meat market and revelling in the uproar" (40). If a man struggles not to commit sin and battles against passionate thoughts, he is humiliated and shattered in the fight, "but the sufferings of combat purify him little by little and bring him back to the natural state" (41). Yet beside man's effort, if the Holy Spirit does not descend, the dead nous cannot be purified and brought to life, because "only the Holy Spirit can purify the nous" (42). In any case, when, through the working together of divine grace and the human will, the nous has been purified, then it is illuminated, since "where there is purifying there is illumination" (43). After purification, if a person guards his nous from defilement by sin, his nous is illuminating and illuminated. That is why guarding the nous can be called "light-producing, lightning-producing, light-giving and fire-bearing" (44). Briefly, we can affirm that man's cure is in fact purification of the nous, heart, and image, the restoration of the nous to its primordial and original beauty, and something more: his communion with God. When he becomes a temple of the Holy Spirit, we say that the cure has succeeded. Those cured are the saints of God. Having seen what Christianity is, what the character of Orthodox theology is, what therapy is, we shall now look at the method of therapeutic treatment, which is the method of the Orthodox faith. If we have so far located the problem, we must now do our best to make an inventory of the methods for achieving purity of heart, that is, the cure. For there is no great point in listing the higher states unless we go on to bring them to awareness and apply them. First we must emphasise right faith. We Orthodox attach great importance to preserving the faith, just because we know that when faith is distorted, the cure is automatically distorted. We have previously emphasised that theology should be interpreted as medicine. Medical science has the healthy person in view when it tries to guide the sick person to health by various therapeutic methods. We can say the same thing about theology. Theology is the teaching of the Church about spiritual health, but also about the path which we sick must follow in order to be healed. That is why we Orthodox give great weight to keeping the doctrine intact, not only because we fear the impairment of a teaching, but because we could lose the possibility of a cure and therefore of salvation. Furthermore, "the conflict between Palamas and Barlaam was not so much about the type of doctrine as about its methodological foundation. Barlaam based himself on metaphysics and metaphysical epistemology and logic, while Palamas took as his basis empirical verification and confirmation and their demonstrable results" (45). Now in order to be cured it is essential to feel that one is ill. When a sick person is not aware of his illness, he cannot turn to a doctor. Self-knowledge is one of the first steps to a cure. St. Maximus teaches: "The person who has come to know the weakness of human nature has gained experience of divine power", and he is eager to achieve some things and has achieved other things through this divine power (46). Peter of Damascus, describing the great value of prayer at night, says: "Practice of the moral virtues is effectuated by meditating on what has happened during the day", when we meditate on the lapses that occurred "in the confusion of the day", "so that during the stillness of the night we can become aware of the sins we have committed and can grieve over them" (47). Only when we know our state can we grieve about it. It is an indisputable fact that most Christians today are unaware of their spiritual condition. We are "dead in trespasses" and not only do not perceive it but even have the feeling that we are filled with the gifts of the Holy Spirit, adorned with virtues. Unfortunately, this self-satisfaction which plagues us is destroying the work of salvation. How can Christ speak to a person who justifies himself? We are like the Pharisee in the time of the Lord who did not feel the need of a physician. How can the great gift of repentance and mourning unfold in a heart which does not feel its desolation, when the inner life is unable to develop? In connection with the sense of being ill there should also be "self-condemnation", that is, the great gift of self-reproach. It shows that there is humility in the soul, since "self-reproach is always associated with humility" (48). This self-reproach is a spiritual burden which, when placed upon the soul, "crushes and presses and squeezes out the salutary wine that rejoices the heart of man, that is, our inner man. Compunction is such a wine." Self-reproach, with the mourning which characterises it, also crushes the passions and fills the heart with most blissful joy (49). "We must always condemn and criticise ourselves in order that by means of deliberately chosen humiliations we may protect ourselves from unwitting sin" (50). But the sense of being ill is not enough in itself. In any case a therapist is required as well. This therapist is the priest, the spiritual father. He has first been cured of his own ailments or at least is struggling to be cured, and then he also cures his spiritual children. We have said before that the spiritual father must be a theologian, and vice versa. So in this case the saying applies "Physician, heal yourself" ((Lk.4,23). One who has come through the devil's devices can safely guide his spiritual children. One who has come to know the great treasure called spiritual health can help others too to be cured. Anyone who has found his nous can help others too to find it. "The truly physician-like nous is one that first heals itself and then heals others of the diseases of which it has been cured" (51). Many contemporary Christians regard priests as ministers of the Most High and as church officials who are helpful in various bureaucratic dealings, who perform the different sacraments when they are needed or celebrate the Divine Liturgy, and in this way can satisfy the need of their souls or fulfil a traditional duty. They are regarded as magicians who work magic! We know, however, that the grace of God is not transmitted magically or mechanically, but sacramentally. It is true that even an unworthy priest performs sacraments, but he cannot cure. For remission of sins is one thing but curing is another. Most Christians are satisfied with a formal confession or formal attendance at the Liturgy or even with a formal Communion and nothing more. They do not proceed to the cure of their souls. But the priests, the spiritual fathers, not only celebrate Communion but they cure people. They have a sound knowledge of the path of healing from passions and they make it known to their spiritual children. They show them how they can be freed from captivity, how their nous will be freed from slavery. "O wondrous man, acquire plasters, potions, razors, eye salves, sponges, instruments for blood-letting and cauterisation, ointments, sleeping draughts, a knife, bandages, and something against nausea (disgust at the stench of wounds). If we do not put these things to use, how are we to practise our science? There is no way, because physicians receive payment not for words but for deeds. "A plaster is a cure for passions which are external, that is, bodily passions. A potion is a cure for inner passions and to drain off invisible uncleanness. A razor is humiliation which bites, but purifies the rot of conceit. An eye salve is for cleansing the eye of the soul which has been clouded by anger. An eye salve is a caustic chastisement which speedily brings healing. Blood-letting is a draining of unseen stench. Again, the blood-letting instrument is pre-eminently an intensive and brief remedy for the salvation of the sick. A sponge is used after the blood-letting to heal and refresh the patient with the gentle, meek and tender words of the physician. Cauterisation is a rule and a penance given with love to the sinner for a definite period of time for his repentance. An ointment is the soothing offered to the patient with a few words or some small consolation after cauterisation. "A sleeping draught is that we lift the person's burden, and through an obedience give him rest and waking sleep and holy blindness to his own virtues. Bandages are for binding and strengthening those who are enervated and enfeebled by vainglory. The last instrument is the knife, which is a sentence and a decree to cut off a putrid member and a body dead in soul lest he spread his contagion among the rest. "Blessed and praiseworthy are the `non-disgust' of the physicians and the dispassion among shepherds. The former, not suffering from nausea, untiringly strive to dispel the stench. The latter will be able to restore to life every dead soul" (53). Fr. John Romanides writes: "The successful repetition of the experience of confirmation, which in medical and patristic science is cure, is the truth of every science. Just as it is absurd to say that one who does not cure and does not know how to cure is a physician, so it is senseless to regard as a theologian one who is not at least in the state of illumination, who does not know what illumination and deification are, and who does not know how these things are achieved and therefore does not cure" (54). Father John also writes: "It is assumed that above all others the therapists who guide the sick into these stages of therapy are the bishops and priests, the former having mostly come from monasticism. Today, however, after a century and a half of catastrophic neo-hellenic propaganda against hesychasm, such clergy are rare. There are few hesychast monks. The priesthood as described by Dionysios the Areopagite has almost disappeared" (55). The therapist priest also recommends to his spiritual children an orthodox way, which is a way of orthodox devotion. Therefore in what follows we want to turn to that point, to describe the method which the sick person should follow under the guidance of his spiritual father in order to attain spiritual healing. We want particularly to point to asceticism. "The forceful practice of self control and love, patience and stillness, will destroy the passions hidden within us" (56). Nicetas St. Stethatos, disciple of St. Symeon the New Theologian, describes this ascetic practice. Man has five senses, so the ascetic practices are five in number: vigils, study, prayer, self-control and hesychia. The ascetic should combine the five senses with these five practices: sight with vigils, hearing with study, smell with prayer, taste with self-control and touch with hesychia. When he succeeds in making these links, "he quickly purifies the nous of his soul and by this refining makes it dispassionate and clear-sighted" (57). We can say briefly that to practise asceticism is to apply God's law, to keep His commandments. The effort which we make to subordinate the will of man to the will of God, and to be changed by this, is called ascesis. We are well aware from the teaching of our holy Fathers that the whole Gospel consists of "precepts of salvation". What is contained in Scripture is God's commandment, which must be kept by those who seek their salvation. This is seen clearly in the Beatitudes (Matt.5,1-12).